Typical Gracie: "Gracie trudged into Big Lake High alone, imagining that she was as invisible as the humid air that pressed in on her from all sides. Inside, the halls buzzed. ... Gracie took out her recording notebook, leaned against her locker, and observed. "Gracie has always been invisible. She doesn't really belong anywhere either. But that's okay. She has her website, where she is free to open up and share her insights. Anonymously. Exactly how she likes it. But then someone figures out it's her, and she has to do something before everyone knows. Because then... then nothing will be the same.Gracie likes to observe people and notice different body language signs that betray what someone really thinks or feels. However, people are harder to deal with in-person. Gracie has to learn to open and ask for forgiveness. She learns that it is good to belong somewhere and NEED people. "Grace Notes" is a pretty good and light read. It also contains some truths about God, though not many. 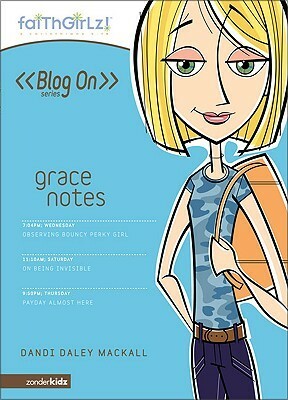 "Grace Notes" is the first in the Faithgirlz/Blog On! series. The later ones are "Love, Annie," "Just Jazz," "Storm Rising," "Grace Under Pressure," "Upsetting Annie," "Jazz Off-Key," and "Storm Warning." This is about Gracie. She's really shy and doesn't have a lot of friends. She does have an amazing gift to be able to read people and how they will react to ceartain things. She finally finds a venue where she can tell about what she knows. So she starts a anonymous blog, where her name is Jane and she studies the people at school and somewhat gossips about them, but understands them in a way that no one else can. But then she finds out that someone has started to figure out who she really is, and she freaks out. It's really good. I enjoyed reading a book about a girl who blogs since I blog now. It was a good start to a series, and reminded me a lot of the Sophie series due to the format of the physical book. I am interested to read the remainder of the series. Grace Notes (Faithgirlz! / Blog On!) by Dandi Daley Mackall is a Christian YA Fiction book that is a funny coming of age story. I can't wait to read the next one. The same author as Love, AnnieThis is the 1st book in the series! Hmm... Thinking about my rating for this one. Short, cute book for young tween/teen girls. Grace has an anonymous blog, what happens when she's outed? Dandi Daley Mackall - A professional writer for over 20 years, Dandi Daley Mackall has written dozens of articles for popular magazines and published around 500 books for children and adults alike, with sales of over 4 million. A frequent guest on radio and television talk shows, she lives in rural Ohio with her husband, three children, horses, dogs, & cats. Awards include the Edgar Award for Best YA Mystery, the Helen Keating Ott Award for Contributions to Children's Literature; Distinguished Alumni Award from Mizzou; ALA Best Book; Christian Children's Book of the Year, Amelia Bloom, Mom's Choice Awards. Her YA novel, My Boyfriends' Dogs, is now a Hallmark movie.